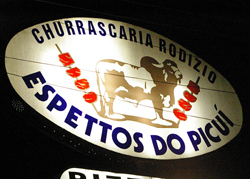 A treat for many Brazilians is a chance to go eat at a Churrascaria Rodizio, roughly translated a barbeque restaurant. But unlike barbeque restaurants in the United States, this restaurant does not cook its mean in a heavy sauce. 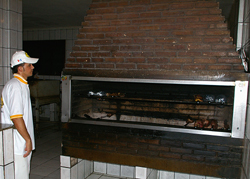 Instead, the meat is cooked in large, open front ovens on metal skewers. Servers come out balancing a metal plate, skewer and knife. 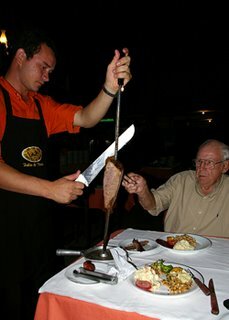 They stop at the table, giving everyone at it a chance to sample the meat. Some feature pork, carne de porco, others carne de vaca or beef. One Brazilian favorite is the skewer that comes with freshly grilled chicken hearts. In addition to the meat, restaurant patrons can sample a variety of salads and side dishes, including mashed potatoes and French Fries or batatas fritas. The bill for the meal came to $15 Real or about $7.50 in U.S. currency--quite cheep for us, but definitely a treat for Brazilians. As we entered the restaurant, right inside the doorway is a sink with soap and paper towels. Most patrons stopped there first to wash their hands before entering the dining area. Another difference from many American restaurants, the Churrascaria had two televisions playing the evening’s telenovela or soap opera. Other than the movies the boys watch at the orphanage (like Shreck) which are in Portuguese, it was my first real chance to see Brazilian television. 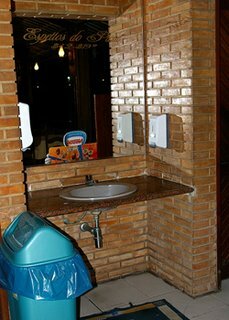 The hand washing station for restaurant patrons at the front of the Churrascaria Rodizio. Kaylea Hutson | JoplinDaily.com.